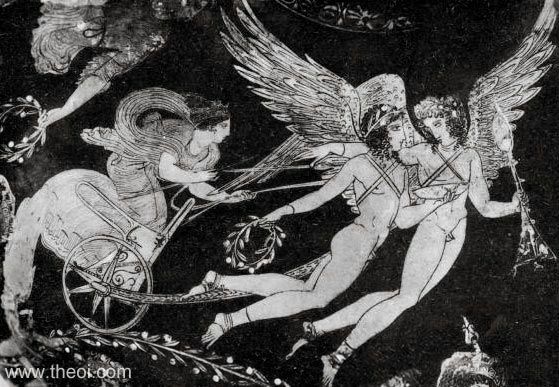 Detail of Aphrodite driving a chariot drawn by a pair of Erotes (winged love-gods) in a scene depicting the love of Phaon and Demonassa. One of the Erotes holds a wreath of myrtle leaves and a plate (phiale), and the other an incense burner. The two are probably Eros (Love) and Himeros (Desire). Other figures in this scene (not shown) are Hygeia, Eudaimonia, Leura, Chrysope, Herosora, Panychis, Apollo, Leto, Phaon and Demonassa.